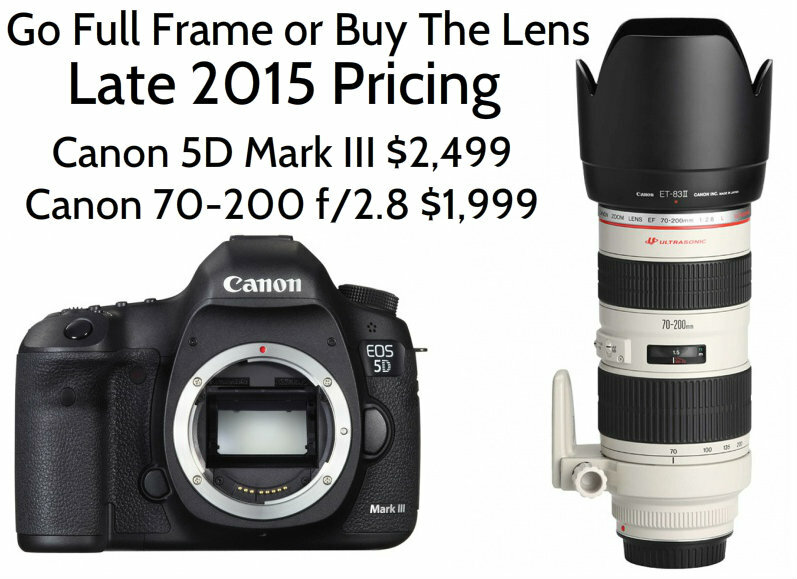 Go To A Full Frame DSLR From APS-C Or Buy A 70-200mm F/2.8 Lens Instead? My blog posts are often inspired by those around me. So I'm hoping a fellow photographer friend reads this and thinks about what I am saying in this post. It's very tempting to want to upgrade (or at least many consider it that way) from an APS-C sensor to a FULL frame sensor. And I must admit that there are some advantages to shooting full frame. I will also admit with the price drop of the 5D Mark III coming down to $2,499 with the release of Canon's new 5Ds and 5Dsr which are both 50 megapixel beasts that I can see why going from APS-C to FULL frame would be very tempting. However, my advice is to invest in the lens (glass) first. Camera bodies will come and go over the years. And with Canon spacing their releases out as far as they do, it's less tempting to upgrade faster than every 3 years if you are committed to the Canon brand like I am. There are many photographers that I know who are still shooting with the Canon 5D Mark II and didn't get the 5D Mark III when it was released in 2012. That's 3 years ago now and they may have been shooting with the Mark II for 2 or 3+ years prior to 2012. But many photographers will likely upgrade to a newer camera body every few years primarily because of sensor technology most likely but also because of all the new features. My guess is that I'm within 2 to 3 years of upgrading to a new camera body which puts me in a 5 to 6 year camera body life cycle with the Mark III. On the other hand, a photographer that buys professional lenses like the Canon L series is likely can use that lens for a lifetime potentially or most likely 10 years minimum. Nice professional glass will last and can be used for 20+ years easily. The ROI on the lens is likely many times over the ROI on the camera body. Yes, lenses get upgraded over time and glass technology changes. However, a photographer that is buying pro lenses is likely planning on keeping those lenses for many years (10-20+) to come. There is already a $500 price difference based on late 2015 pricing. My prediction is that by late 2016 the 5D Mark III may even be $1,999. It's a workhorse of a camera and an amazing deal even at $2,499. However, if I were shooting APS-C and considering which way to go, it would be hands down the $1,999 lens investment pending of course what I shot most of because it's great for portraits but not landscapes. So there is always that argument. However, I know that my fellow photographer friend is a portrait shooter not a landscape shooter. There could also be an argument for the 24-70mm f/2.8 Canon L lens which I would still consider buying vs. going full frame pending what I shot most of. The quality of images with that lens on an APS-C sensor will be fantastic. And the nice thing about the lens is that it will work with APS-C or FULL frame, so the lens will still be around if and when a photographer makes the transition. The Canon 70-200 f/2.8 is without a doubt my favorite go to lens because I shoot a lot of headshots and a lot of events. I'd have no problem using it on an APS-C camera if necessary. In closing, let's look at a math equation: $2,499 for the camera body which although it could last for more than 5 years, it's very possible that over a period of 10 years that a photographer will upgrade another time within that period. So hypothetically 2 camera bodies x $2,500 = $5,000 / 10 years equals a cost of $500 per year. Now whether the photographer is shooting APS-C or FULL frame, there will be similar math that can be factored out because there will likely be a camera body upgrade happening within 10 years. However, on the lens side, at 10 years for $2,000, that's an average annual cost of $200 per year and the lens could go 15 years ($150 per year) or 20 years ($100 per year) or more. My fellow photographer friend, in my opinion, should set his sites on the lens and not the FULL frame body. He should upgrade to the body at a later date. If my prediction is correct that the 5D Mark III could be $1,999 at the end of 2016 that may be the time to jump to full frame. But not the cart before the horse, I mean the body before the lens. What do I know? It's just my 2 cents worth.